The decision to take this class was one of the best decisions I have made in my college career. 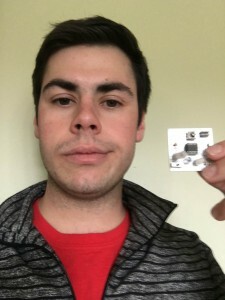 Week in and week out I found myself inspired by a new piece of technology that I had never heard of. Even more inspiring was the way these technologies were making the world a better place. I think it is incredible that machines like 3D printers can be applied to so many fields to save lives and make the world a better place. When deciding on my semester-long project, my head was all over the place. 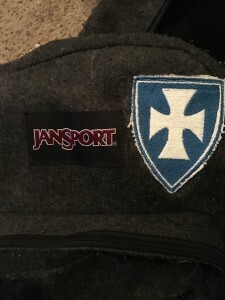 I considered helping with the smart glove (fantastic idea), or pursuing some sort of business-related application so that I could sell my idea. Instead, I settled on solving a different need. Jack Carlson and I spent the semester working on a light-up, fully functioning and wearable DJ-helmet, similar to ones used by professional DJs such as Deadmau5 or Daft Punk. While this idea sounds ridiculous, there is a reason why these artists choose to perform the way they do. Anonymity is a huge part of art in the 21st century, as many artist choose to “make art for arts sake”. 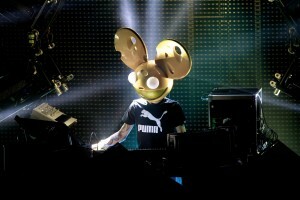 Additionally, many performers choose to obscure their identity out of embarrassment. I would say that I fall into the second category. 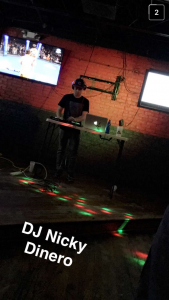 This semester, I entered a DJ competition at a local bar. I knew that my performance would benefit from light effects and added mystique, so my friend and partner Jack had the idea to create a DJ mask similar to the ones shown above. While the mask was not ready by the time of my performance,we still were able to create some prototypes that could be used by DJs in the future. 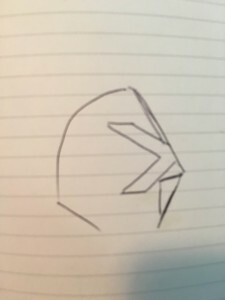 Our first step in the design process was laying out what we wanted the helmet/mask to look like. 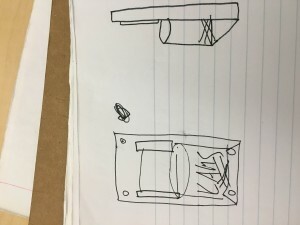 We sketched some front and side views in a notebook. We drew from many inspirations for the etchings on the helmet. 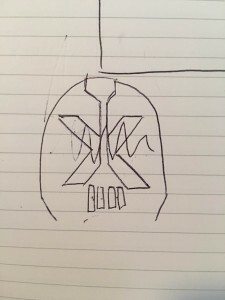 The outer, black part of the mask was designed with Darth Maul inspired insignias from Star Wars, and the red, inner part of the mask was taken from an album cover by the band the Arctic Monkeys. Next was deciding what materials to use. For the interior, Jack had the idea to use glue foam together into a large block, and then shape it with knives and cut out the middle so that a head could fit in. We glued the foam together with liquid nails, let it dry, and came back to the FabLab to check it out from day to day. During the drying process, we rasterized and cut acrylic to form the red and black shiny parts of the mask. We also 3D printed ear and mouth holes for the mask. After that, we returned to the FabLab workshop to realize we had used to much glue, and that we would be unable to cut through the foam. Essentially, prototype 1 had failed. Our next idea was to buy a helmet from a costume store, and attach our pieces to that. while I have been away from campus, Jack has been working on putting all our pieces together. 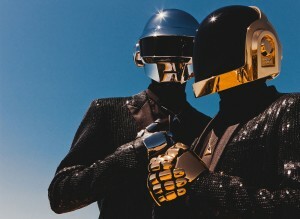 Hopefully we will have time to use arduinos to the helmet so that it will light up during a performance. 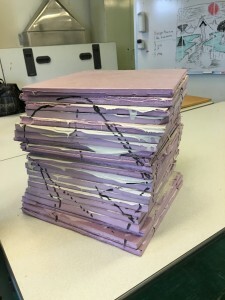 I would say the biggest thing I have learned from this project is that like any tech-related project, it is an iterative and incremental process. At times, we worked too quickly which led to us making stupid mistakes. Luckily this is only prototype 2! Hopefully in the future Jack and I can collaborate on future creative projects and make them more effective and efficient. While final projects and exams in other classes have kept us busy over the past few weeks, Jack and I were able to get through the first step of the construction of our helmet: gluing stacks of foam together. On Monday, we plan on carving this foam into a helmet-like shape, and carve out the middle so that a head will be able to fit inside of it. The gluing and drying process took almost a full week. There were a few time lags as we had to find the right type of glue to insure the foam would stick and settle together properly. 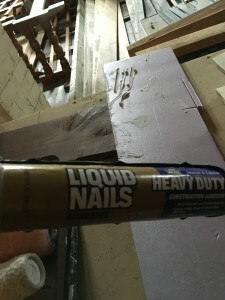 I had to make multiple trips to Menards to resupply on liquid nails, a tough adhesive, typically used in construction projects. Additionally, we have been drawing up some designs as to how we want the outer shell of the helmet to look. We rastered and cut some acrylic for the eyes of the mask, and plan on 3D printing a front grill. We also have been considering 3D printing additional parts such as ears/horns/headphones that we could attach to the sides. In the coming weeks we will be working and experimenting more with acrylic and 3D prints. We also plan on adding arduinos to the grill and front of the mask as well. 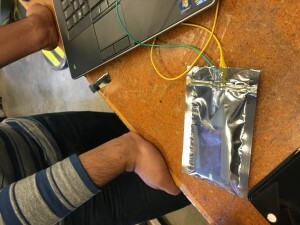 Last week in Digital Making, we had a lesson in soldering, something I would have never expected to do in a class about cutting edge technology. As insane as it seems, soldering is something that computer “nerds” have been doing since the early days of Silicon Valley. I almost felt like Steve Jobs and Wozniak working alongside my friend Jack in the impromptu lab we set up in Wohlers Hall. It was awesome to see how intricate and precise the work is that goes into making a computer chip. Unfortunately, I got so excited with the idea of making a computer chip, I missed a step of the production process and was unable to get the light on my chip to light up. Either way, not too shabby for my first attempt at soldering. Here is a photo of me and my failed creation (unfortunately is got crushed in my backpack on the way home). Soldering itself was very interesting to me because the process of doing it right is so delicate. Pulling the soldering iron away from the chip at the exact right time is something that it took me a few tries to get right. I also really enjoyed the meeting Aric the other creator of the UIUC MakerLab. We didn’t really have time to converse but it was cool to see the other mind behind the lab. Our presenter, Mitch was a bit eccentric, but was pretty good at explaining how to soldering properly. He spoke a bit fast at times, but was extremely helpful whenever anyone had questions. After spring break I will be sure to look into his other endeavor, Cornfield Electronics. I also could definitely use a TV-Be-Gone at the bar I work at because I am constantly having issues turning off and on all of the TVs. 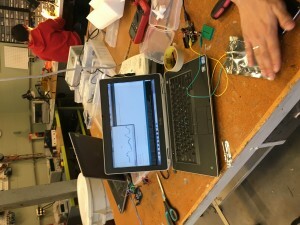 Overall, the lesson from this week was empowering because it shows how, in two hours our whole class could go from knowing little about how computers operate internally, to creating motion responsive microchips in a classroom that would normally be used for Econ discussions. This past week’s class was my personal favorite thus far and really got me thinking creatively about my semester long project and ability to create. When I heard we were meeting in a different building for class I assumed it would be just another classroom with some different technology. 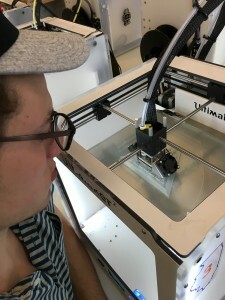 In reality, the FabLab as a concept really showed me how “makers” can utilize the things and tools they know, and come together to solve problems. Specifically, I am an IT and Marketing major, so a lot of designing parts of the class go over my head. The early stages of my semester long project were a bit discouraging as I was unsure what I wanted to do, or how to go about it. Seeing the way people collaborate in the FabLab is inspiring because it shows you don’t have to know everything to do great things, you can learn from and help those around you. Taking this knowledge, I used the class Facebook page and saw another student with a similar idea to mine (cupholder). If we determine it is feasible and that we want to work together, we plan on making a portable, suction cup cup holder than can conduct thermal energy in order to charge phones. Updates to this idea will come this week. Learning Fusion 360 over the past two weeks has been a turning point in the semester for me and my perspectives towards 3D printing. I knew the technology was groundbreaking and saw the designs that could be exported from Thingiverse and other websites, however, seeing a lamp built from scratch on my own computer screen is when the potential of this technology really clicked. While Fusion 360 is fairly complicated and a lot to take in at first, it is unbelievable to me that basically any object that you can imagine can be made in a matter of hours with a 3D printer. I especially liked the render tool, because it brought the items to life and made them look realistic. In the near future, I would like to go to a 3D printing lab where I could print with different types of materials and metals. This past weekend, I spoke to my 11 year old cousin who owns a 3D printing pen. 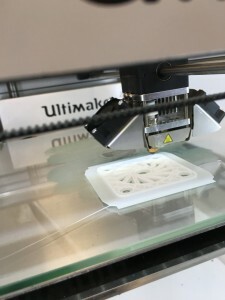 I was astounded to learn that his middle school is investing in 3D printers just as a school would invest in traditional 2D printers in the past. His skills and creativity already outweigh mine. It was during this conversation that had another realization about the potential of 3D printing. Having generations of children grow up with this technology in their schools will develop the making economy rapidly. I told him about the class I’m in and think I may have recruited a future Illini! Lastly, I took time this week to pitch my semester project on Facebook. I am planning on printing and selling cup holders to local bars, restaurants, and students. These cup holders will be customizable, and can be screwed into the wall or stuck to the wall with suction cups. I was inspired to make these after putting drinks on top of gross urinals far too many times. I’m sure this idea will evolve greatly throughout the semester.